The 2012 presidential race has been a leading news item for more than 22 months, and I’m ready for it to be over. The election has grown far beyond television ads and news articles. I can’t open my email without a plea for money at the top of my inbox, and nowhere is less safe than my Facebook or Twitter feeds. David Kaufman is the president of the College Republicans at the University of Massachusetts, Amherst, and he’s experienced a similar onslaught of election-spam. “There’s always something from Romney, always something from Paul Ryan. There’s always something sponsored on Twitter that he’s paying for, something trending. Believe it or not, a lot of people my age get information through memes,” Kaufman said. He mentioned one image of President Obama that's been making the internet rounds that uses a metaphor of toddlers, blocks, and naptime to riff on fears of socialistic income redistribution. "They're going to remember that joke, that's going to resonate with them a lot more than some 10 minute speech about how great Romney's tax plan is, quite frankly." Kaufman was adamant that his party has stepped up their web game, but that doesn’t mean the social media playing field has been leveled. Mitt Romney has more than one and a half million followers on Twitter, but that’s eclipsed by Obama’s 21.5 million. 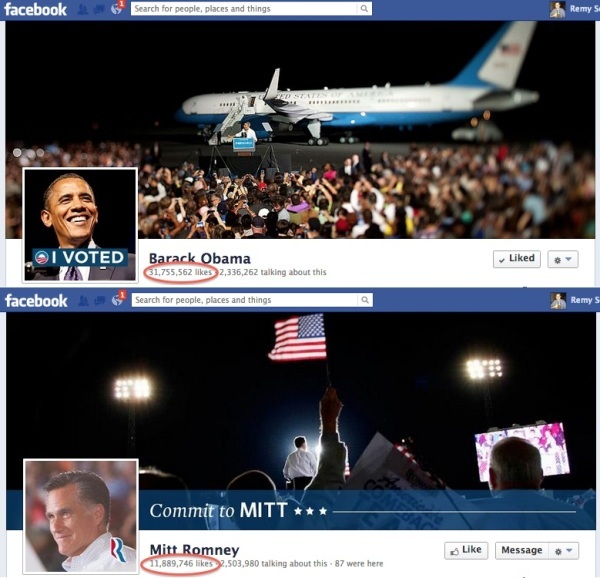 Facebook isn’t much different, where the president has 20 million more “friends” than Romney. But will these numbers have an impact on election day? Charlton McIlwain is an associate professor of media at New York University, and he’s not sure that 18-35 year olds are worth banking on. But communicating through social media only scratches the surface of digital politics. Large teams of strategists and specialized companies run digital campaigns. Most of these private firms have popped up in the last eight years. One of the first was called Blue State Digital, which Jascha Franklin-Hodge co-founded. After Obama’s groundbreaking web campaign, two Republican National Committee staffers started their own digital firm in 2009 called Targeted Victory. Like Blue State for the democrats, they work for Republican candidates and causes, but have no formal affiliation with their party. Zac Moffatt was a co-founder of Targeted Victory and works as Romney’s digital director. No one from there returned my emails, but in an interview with PBS's Frontline in October, Moffat said his team doesn't evaluate their success against the Obama campaign's, "...because if we did we'd be judging ourselves against an institution that's been around for six years and who's run unopposed for the last three." Moffat said he recognizes that President Obama has a more established online following, so his team has invested in a different strategy – data mining. Romney’s team has made a lot of money this way. Obama’s campaign has been less active in using data mining as a fundraising tool. McIlwain attributes this to the size of its base. Instead of fishing for a few large checks, the campaign reaches out to everyone on its giant list and ask for a few bucks, crowdfunding in the manner of websites like kickstarter.com. Evidon, which tracks online trackers, has developed software that “reveals the invisible web” and shows people when they’re being followed. It found that from May to September, BarackObama.com was much more actively tracking its users than MittRomney.com, which may have helped maintain the President’s social media lead, and thus his fundraising ability. For digital strategists, this election is pretty much over. There’s not much more to do besides get people to the polls. And that’s something that can only happen face to face and pen to paper.